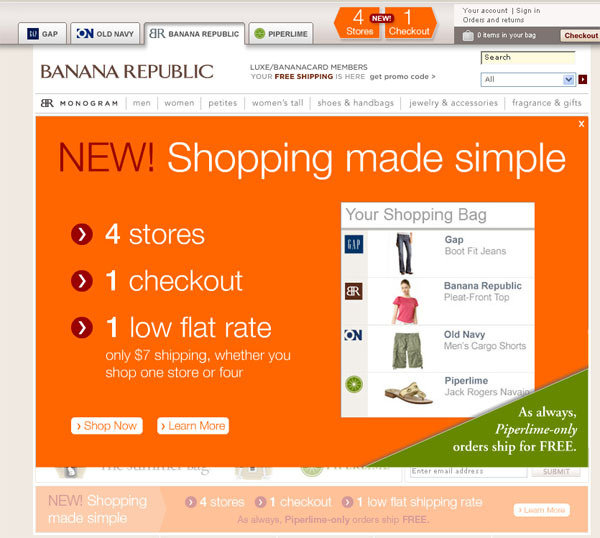 Gap, Banana Republic, Pepper Lime and Old Navy are now all linked online. You can now shop at all four websites and check out only one time, its utilitarian, but not all that attractive. Does that mean gift cards are now also transferable between stores? I looked at the details and i don't think they are. I know there are giftcards in existence that are good at G/BR/ON but they are special giftcards. I wish they worked everywhere though. Gift cards WILL work at any of the stores. I just noticed this today! That would make sense, if you can shop in one place that you can use any gift card. I vote for that. At least not in Canada. I have enough people trying to do that already! YOU CAN'T ahah. Sure, it'd be nice, but for the sake of 18 year old cashiers everywhere who fear being yelled at by angry, Old Navy gift card receiving women, you can't do that yet.